Grill the steak according to desired level of doneness. Let the steak rest while preparing the rest of the ingredients. Very lightly coat the frozen French fries with olive oil and season with salt & black pepper. Place the fries on the grill at medium heat level being careful not to let the fries fall through the grates. Turn the fries occasionally so they do not get too dark on one side. Grill the fries for 6-8 minutes or until cooked through. Divide the lettuce between two bowls or plates. Put approximately 1 cup of grilled French fries on each salad. 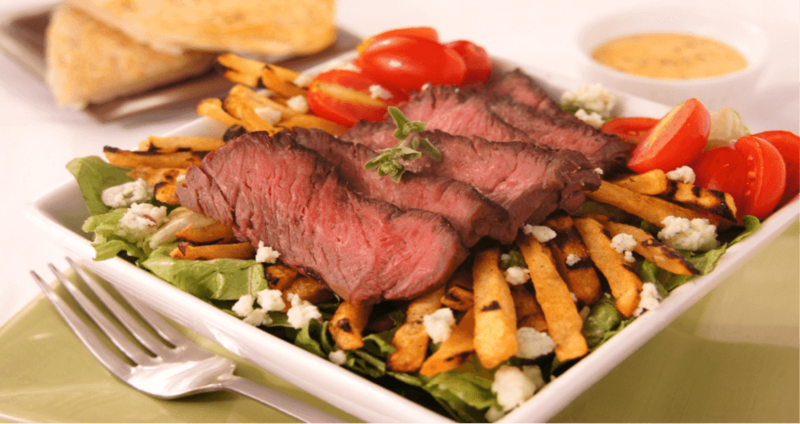 Cut the steak into thin slices and divide evenly on top of the two salads. Place 1/4 cup of sliced grape tomatoes on each salad. Garnish each salad with crumbled gorgonzola cheese and serve with the creamy chipotle dressing.